A goal of the Affordable Care Act is to increase competition and transparency in the markets for individual and small group insurance, leading to higher quality, more affordable products. 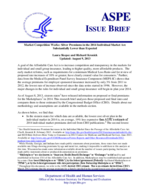 As of August 2013, sixteen states have released information on proposed or final premiums for the Marketplaces in 2014. This research brief analyzes those proposed and final rates and compares them to those estimated by the Congressional Budget Office (CBO). Overall, silver premiums in the 2014 individual market are substantially lower than expected. A goal of the Affordable Care Act is to increase competition and transparency in the markets for individual and small group insurance, leading to higher quality, more affordable products. The early market reforms, such as requirements for a minimum Medical Loss Ratio and for review of proposed rate increases of 10% or greater, have clearly created value for consumers. Further, data from the Medical Expenditure Panel Survey Insurance Component (MEPS-IC) shows that the average premiums for employer sponsored insurance increased by only 3% from 2011 to 2012, the lowest rate of increase observed since the data series started in 1996. However, the major changes in the rules for individual and small group insurance will begin in plan year 2014. As of August 8, 2013, sixteen states have released information on proposed or final premiums for the Marketplaces in 2014. This research brief analyzes those proposed and final rates and compares them to those estimated by the Congressional Budget Office (CBO). Details about our methodology and assumptions are available in the methods section. In the sixteen states for which data are available, the lowest cost silver plan in the individual market in 2014 is, on average, 19% less expensive than ASPE’s estimate of 2014 individual market premiums derived from CBO publications. The second lowest cost silver plan in the individual market in 2014 is, on average, at least 13% less expensive than the ASPE-derived CBO estimate. In a number of states (MD, OR, RI, VT), the rate review process and competition resulted in final rates that are significantly below rates proposed earlier this spring. The premium estimates presented here are before tax credits, which will lower out-of-pocket costs for consumers. For example, a 25-year-old man earning $20,000 per year in New York would pay no more than $85 per month for the second lowest cost silver plan, which is 76% lower than the average second lowest cost premium in New York. While further work is needed to better understand 2014 rates, the results strongly suggest that greater competition and transparency are leading to substantial benefits for both consumers and employers in these markets. From the premiums released by sixteen states, the lowest cost silver plan in the individual market is 19% lower than the ASPE-derived CBO estimate of 2014 individual market premiums (Figure 1), and the premium for the second lowest cost silver plan is at least 13% lower than the ASPE-derived CBO estimate (Figure 2). We included both the lowest and second lowest cost silver plans in our analysis for two reasons. First, while tax credits are tied to the cost of the second lowest silver premium, consumers can use their tax credit to purchase the lowest cost silver plan, thereby increasing the portion of their premium covered by the tax credit. Second, we do not have complete information on the second lowest cost silver plan in each state, as some states have only released the lowest silver premium for each issuer. As noted in the methods section, we make some assumptions about medical trend and about reinsurance parameters for the Affordable Care Act reinsurance program in order to infer a 2014 premium consistent with the 2016 CBO premium estimates, and we make assumptions about the age distribution of individual market enrollees in order to compare the proposed premiums by age group for 2014 with the average premium estimated by CBO. With that caveat, the average premiums proposed for the lowest cost and second lowest cost plans in the sixteen states where data are available are substantially below the second lowest cost plan that was inferred from the CBO model. It is possible that the sixteen states for which we have data are not representative of the rest of the nation, and that, when data are available from all fifty states and the District of Columbia, the weighted national averages will be much closer to the ASPE-derived CBO estimates. However, we note that the weighted average small group premiums from MEPS-IC data in these sixteen states is close to the national average, and that data on per capita health spending in these sixteen states from the CMS Office of the Actuary’s National Health Accounts also shows the weighted average per capita spending in these states is close to the national average. Thus, it seems unlikely that a weighted average of all states will be significantly different. For individual states, however, the state-level premiums may be closer to ASPE-derived CBO estimates, while national or multi-state averages remain below ASPE-derived CBO estimates. Although there are many hypotheses that might account for the finding that actual premiums appear to be substantially below ASPE-derived CBO estimates, a likely explanation is that greater competition and greater transparency are driving down prices in the Marketplace. We note that, although the ASPE-derived CBO estimate of 2014 premiums is higher than the actual 2014 premium costs seen to date, the ASPE-derived CBO estimate was still much closer to actual 2014 premiums than those of many other analysts. For example, in a 2009 report, Oliver Wyman estimated that the average premium for an individual purchasing coverage in the individual market would be $4,561(or $380 per month) in 2009 dollars due to the Affordable Care Act reforms, and that this would represent a 54% premium increase over the status quo. It is not clear from the report what actuarial value (AV) level the Oliver Wyman analysis assumed, but it seems likely that the assumption was for an AV no greater than a silver level, and probably less. We trended forward the 2009 estimate to 2014 dollars using CMS Office of the Actuary trends in private health insurance per person, which is almost certainly a substantial underestimate of the rate of increase in individual market premiums. This yields a 2014 estimated premium of $5,400 annually, or $450 per month. Even using this low estimate of trend, and assuming the average individual market actuarial value is in the silver range (which is likely an overestimate), the Oliver Wyman predictions are clearly far above the reality of 2014 premiums. In the sixteen states with available data, 2014 premiums average $316 per month for the lowest cost silver plan, and $342 per month for the second lowest cost plan. Note: Rates are averaged across multiple regions for California, Connecticut, New York, and Ohio, and are for the entire state in DC, Rhode Island, and Vermont. Rates are from the following cities: Bridgeport, Hartford, and New Haven, Connecticut; Denver, Colorado; Portland, Maine; Baltimore, Maryland; Albuquerque, New Mexico; Las Vegas, Nevada; Cincinnati and Cleveland, Ohio; Portland, Oregon; Sioux Falls, South Dakota; Richmond, Virginia; Seattle, Washington. Final rates were used where available (MD, NY, OH, OR, VT, WA). Note that not all company filings are available for Ohio and Virginia, so the lowest cost silver premiums may be lower than presented here. Sources: Congressional Budget Office estimate derived as described in footnote 12. State data frompublicly available sources, weighted by RAND COMPARE estimate of enrollment by age in the individual market in 2014. US average constructed by weighting each state according to its proportion of individual market enrollees per the 2011 Medical Loss Ratio filings. Note: Rates are averaged across multiple regions for California, Connecticut, Florida, New York, and Ohio, and are for the entire state in DC, Rhode Island, and Vermont. Rates are from the following cities: Bridgeport, Hartford, and New Haven, Connecticut; Denver, Colorado; Miami, Tampa, and Orlando, Florida; Atlanta, Georgia; Chicago, Illinois; Portland, Maine; Baltimore, Maryland; Albuquerque, New Mexico; Las Vegas, Nevada; Cincinnati and Cleveland, Ohio; Portland, Oregon; Sioux Falls, South Dakota; Richmond, Virginia; Seattle, Washington. Note that final rates are used when available, and that the second lowest cost silver plan was used in Colorado, Connecticut, DC, New Mexico, Ohio, Oregon, Rhode Island, Vermont, and Washington. For all other states, the second lowest cost issuer was used due to data limitations. Final rates are used where available (MD, NY, OH, OR, RI, VT, WA). Note that not all company filings are available for Ohio and Virginia, so the second lowest cost silver premiums may be lower than presented here. Twelve states have posted health insurance premiums for their state-based Marketplace, and an additional four states have posted health insurance premiums for their Federally-facilitated Marketplaces or State Partnership Marketplaces. In each of these states, information is available on the proposed or final premium payments, by age, for each of the issuers that is proposing to sell plans in the individual market. The ASPE-derived CBO premium estimate was derived from the March 2012 CBO estimate that the average family would pay $15,400 in 2016 for coverage in the second lowest cost silver plan. This estimate was adjusted to reflect single individual market coverage in 2014 by using a single coverage to family coverage ratio of 1:2.7, trending backward at 5.5% per year to 2014, and adjusting for higher levels of reinsurance payments in 2014, yielding an estimated 2014 single premium of $4,700. For comparison to proposed 2014 individual market premiums, we weighted by the expected age distribution of individual market enrollees in 2014 from the RAND COMPARE microsimulation model. To arrive at a national estimate, we weighted state-level premiums by the number of current individual market enrollees in each state from the 2011 Medical Loss Ratio data collection. Due to data limitations, we are unable to directly compare the ASPE-derived CBO estimates to the price of the second lowest cost silver plan in 2014 for every state. Therefore, for California, Maine, Maryland, Nevada, New York, South Dakota, and Virginia, we have presented a comparison to the lowest cost silver plan from the second lowest cost silver issuer. It is likely that the second lowest cost silver plan will differ very little in price from the lowest cost silver plan, as both plans will often be from the same issuer. Our estimates here can be thought of as a range that captures the second lowest cost silver plan for the states above. For all other states, Figure 2 presents the second lowest cost silver plan. While Florida, Georgia, and Indiana have made public statements about premiums, those states have not made available rate filings showing premiums by age and metal tier, making it impossible to add them to this analysis at this time. Wisconsin has made some information available about the number of issuers participating, but has not made public statements about or produced documentation on premiums. “Marketplaces” are also known as “American Health Benefit Exchanges” or “Exchanges” as defined by and established in Section 1311 of the Affordable Care Act. In addition, Marketplaces may be established and operated by a state (State-based Marketplaces or “SBMs”), by the federal government (Federally-facilitated Marketplaces or “FFMs”), or by the federal government with state participation (State Partnership Marketplaces or “SPMs”). Throughout this document, we refer to the ASPE-derived CBO estimate. This is an estimate derived from CBO’s March 2012 estimate that the average premium for a family enrolled in the second lowest cost silver plan will be $15,400 in 2016. See the methods section for details on how we derived a 2014 single premium from CBO’s 2016 estimate. In some states, it is not yet possible to determine the second lowest cost silver plan, as the state has only released information on the least expensive silver plan for each issuer. When additional data becomes available, we expect that the second lowest cost silver plan in these states may be lower than presented in Figure 2. These states include California, Maryland, Maine, Nevada, New York, South Dakota, and Virginia. The Florida Office of Insurance Regulation notes that the average silver premium across all silver plans in all rating areas for Humana is $315 and for Coventry is $366. It is likely that the lowest-priced Humana and Coventry plans are below this average. Also, we note that we do not know how Florida weighted by age to develop this average. See http://www.floir.com/siteDocuments/Avg_Costs_PPACA.pdf. Analysis of National Health Accounts data finds that average per capita spending for the 14 states is approximately 3% higher than the national average, and analysis of data from the Medical Expenditure Panel Survey – Insurance Component shows average premiums on employer-sponsored insurance in these 14 states is approximately 1% below the national average. We trended forward to 2014 using estimates of per enrollee private health insurance spending increases from 2012 to 2013 and 2013 to 2014 from the Office of the Actuary described in footnote 8, as well as 2009-2010 and 2010-2011 estimates from https://www.cms.gov/Research-Statistics-Data-and-Systems/Statistics-Trends-and-Reports/NationalHealthExpendData/Downloads/tables.pdf. The 2011-2012 estimate, also from the Office of the Actuary, was 3.2%. Many people would expect that actual trend will be higher than these estimates, particularly for individual market premium growth. To the extent that actual trend is higher, our analysis is conservative – that is, true savings are likely higher than those estimated here. The states are: California, Colorado, Connecticut, District of Columbia, Maryland, Nevada, New Mexico, New York, Ohio, Oregon, Rhode Island, South Dakota, Vermont, Virginia, and Washington. CBO and JCT’s Estimates of the Effects of the Affordable Care Act on the Number of People Obtaining Employment-Based Health Insurance. March 2012. Available at: http://cbo.gov/system/files/cbofiles/attachments/03-15-ACA_and_Insurance_2.pdf. Single coverage to family coverage ratio derived from: Letter to the Honorable Evan Bayh providing an analysis of health insurance premiums under the Patient Protection and Affordable Care Act. Congressional Budget Office. November 30, 2009. Available at: http://cbo.gov/system/files/cbofiles/ftpdocs/107xx/doc10781/11-30-premiums.pdf. Annual increase in premiums of 5.5% from the Congressional Budget Office’s March 2013 Baseline. Our inference about CBO’s assumptions about reinsurance recoveries as a percentage of premium is 2% in 2016 and 10% in 2014. The reinsurance inference was derived using the following assumptions. From the March 2013 CBO baseline, we estimate there will be approximately 20 million individual market enrollees in 2014 (7 million Exchange enrollees, 13 million other individual market enrollees). This leads to a very approximate market size of $100 billion based on an approximate average premium of $5000, which would yield a 10% reduction in premiums due to reinsurance (10 billion/100 billion). Also from the March 2013 CBO baseline, we estimate there will be roughly 35 million individual market enrollees in 2016. This leads to a very approximate market size of roughly $200 billion including trend, which would yield a roughly 2% reduction in premiums due to reinsurance (4 billion/200 billion).